In this webinar we take a look at the internal and external threat networks pervasive in todays enterprise and explore why organizations need granular network intelligence. I’m one of the senior engineers here with NetFlow Auditor. I’ll be taking you through the webinar today. It should take about 30 to 40 minutes, I would say and then we will get to some questions towards the end. So let’s get started. So the first big question here is, “Why would you need something like this? Why would you need Granular Network Intelligence?” And the answer, if not obvious already, is that, really, in today’s connected world, every incident response includes a communications component. What we mean by that is in a managed environment, whether it’s traditional network management or security management, anytime that there’s an alert or some sort of incident that needs to be responded to, a part of that response is always going to be communications, who’s talking to who, what did they do, how much bandwidth did they use, who did they talk to? And in a security particular environment, we need to be looking at things like whether external threats or internal threats, was there a data breach, can I look at the historical behavior or patterns, can I put this traffic into context as per the sort of baseline of that traffic? So that insight into how systems have communicated is critical. Just some background industry kind of information. According to Gartner, targeted attacks are set to render prevention-centric security strategies obsolete by 2020. Basically, what that means is there’s going to be a shift. They believe there’s going to be a shift to information and end-user-centric security focused on an infrastructure’s end-points and away from sort of the blocking and tackling of firewalls. They believe that there’ll be three big trends continuous compromise, meaning that an increased in level of advanced attacks, targeted attacks. It’s not going to stop. You’re never going to feel safe that someone won’t be potentially trying to attack you. And most of those attacks will become financially motivated attacks, attempts to steal information and attempts to gather credit card data, if you have that, intellectual property, ransomware-type attacks. So this is not necessarily, “Hey, I’m just going to try and bring down your website or something,” in a traditional world where maybe people are playing around a little bit. This is more organized attacks specifically designed to either elicit a ransom or a reward or just steal information that could be turned into money out in a black market and it’s going to be more and more difficult for IT to have control over those end-user’s devices. Again, very few organizations just have people sitting at their desks with desktop computers anymore. Everybody’s got laptops. Everybody’s got a phone or other tablet that’s moving around. People work from home. They work from the road. They’re connecting in to network resources from anywhere in the world at any time and it becomes more and more challenging for IT to sort of control those pathways of communications. So if you can’t control it, then you have to certainly be able to monitor it and react to it and the reaction is really in three major ways; determining the origin of the attack, the nature of the attack, and the damage incurred. So we’re certainly assuming that there are going to be attacks, and we need to know where they’re coming from, what they’re trying to do, and have they been able to get there? You know, have we caught it in time or has something already been infected or has information been taken away from the network and that really leads us into this little graphic that we have about not being in denial. Understanding that, unfortunately, many people, in terms of their real visibility into the network, are somewhere in the blind or limited-type area. They don’t know what they don’t know, they think they should know but they don’t know, and etc. But where they really need to be is at, “There’s nothing they don’t know.” And they need tools to be able to move them from wherever they are into this upper left-hand quadrant and certainly, that’s what our product is designed to do. So just kind of looking at the entire landscape of information flow from outside and inside and really understanding that there are new kinds of attacks, crawlers, botnets, ransomware, ToR, DoS and DDoS attacks that have been around for a while. Your network may be used to download or host illicit material, leak intellectual property, be part of an attack, you know, something that’s command and controlled from somewhere else and your internal assets have become zombies and are being controlled by outside. There are lots of different threats. They’re all coming at you from all over the place. They’re all trying to get inside your network to do bad things and those attacks or that communication needs to be tracked. Gartner also believes that 60% of enterprise security budgets will be allocated for rapid detection and response by 2020, up from less than 10% just a few years ago. What they believe is that too much of the spending has gone into prevention and not enough has gone into monitoring and response. So the prevention is that traditional firewalling, intrusion detection or intrusion prevention, things like that, which certainly is important. I’m not saying that those things aren’t useful or needed. But what we believe and what other industry analysts certainly believe is that that’s not enough, basically. There needs to be more than the simple sort of “Put up a wall around it and no one will be able to get in” kind of situation. If that were the case, then there would be no incidents anywhere because everybody’s got a firewall; large companies, small companies. Everybody’s got that today, and yet, you certainly don’t go more than a couple of days without hearing about new hacks, new incidents. Here in the United States, we just came through an election where they’re still talking about people from other countries hacking into one party or another’s servers to try and change the election results. You know, on the enterprise side, there are lots and lots of businesses. Yahoo recently in the last couple of months certainly had a major attack that they had to come clean about it and of course both of those organizations, certainly Yahoo, you know, they’re an IT system. They have those standard intrusion prevention and firewall-type systems, but obviously, they aren’t enough. So when you are breached, you need to be able to look and see what happened, “What can I still identify, what can I still control, and how do I get visibility as to what happened.” So for us, we believe that the information about the communication is the most important focal point for a security strategy and we can look at a few different ways to do that without a signature-based mechanism. So there’s ways to look at normal traffic and be able to very rapidly identify deviation from normal traffic. There’s ways to find outliers and repeat offenders. There’s ways to find nefarious traffic by correlating real-time threat feeds with current flows and we’re going to be talking about all of these today so that a security team can identify what was targeted, what was potentially compromised, what information may have left the building, so to speak. There’s a lot of challenges faced by existing firewalls, SIEM, and loosely-coupled toolsets. The level of sophistication, it’s going up and up again. It’s becoming more organized. It’s an international crime syndicate with very, very intelligent people using these tactics to try and gain money. As we’ve talked about, blocking attack, laying end-point solutions are just not enough anymore and of course, there’s a huge cost in trying to deploy, trying to maintain multiple solutions. So being able to try and have some tools that aren’t incredibly expensive, that do give you valuable information really, can become the best way to go. If you look at, say, what we’re calling sensors; packet captures, DPI-type systems. They, certainly, can do quite a lot, but they’re incredibly expensive to deploy across a large organization. If you’re trying to do packet capture, it’s very, very prohibitive. You can get a lot of detail, but trying to put those sensors everywhere is just… unless you’ve got an unlimited budget, and very few people do, that becomes a really difficult proposition to swallow. But that doesn’t mean NetFlow can’t still use that kind of information. What we have found and what’s really been a major trend over the last couple of years is that existing vendors, on their devices, Check Point, Cisco, Palo Alto, packet brokers like Ixia, or all of the different people that you see up here, and more and more all the time, are actually adding that DPI information into their flow data. So it’s not separate from flow data. It’s these devices that have the packets going through them that can look at them all the way to layer seven and then include that information in the NetFlow export out to a product like ours that can collect it and display that. So you can look into payload and classify according to payload content identifying traffic on port 80 or what have you, that you can connect the dots between inside and outside when there’s NAT. To be able to read the URLs and quickly analyze where they’re going and what they’re being used for. Getting specialized information like MAC address information or, if it’s a firewall, getting denial information or AAA information, if it’s a wireless LAN controller, getting SSID information, and other kinds of things that can be very useful to track down where people were talking. So different types of systems are adding different kinds of information to the exports, but all of them, together, really effectively give you that same capability as if you had those sniffing products all over the place or packet capture products all over the place. But you can do it right in the devices, right from the manufacturer, send it through NetFlow, to us, and still get that quality information without having to spend so much money to do it. The SANS organization, if you’re not familiar with them, great organization, provide a lot of good information and whitepapers and things like that. They have, very often, said that NetFlow might be the single most valuable source of evidence in network investigations of all sorts, security investigations, performance investigations, whatever it may be. The NetFlow data can give you very high value intelligence about the communications. But the key is in understanding how to get it and how to use it. Some other benefits of using NetFlow, before packet capture is the lack of need for huge storage requirements. Certainly, as compared to traditional packet capture, NetFlow is much skinnier than that and you can store much longer-term information than you could if you had to store all of the packets. The cost, we’ve talked about. And there are some interesting things like legal issues that are mitigated. If you are actually capturing all packets, then you may run into compliance issues for things like PCI or HIPAA. In certain different countries and jurisdictions around the world have very strict regulations about maintaining the end-data and keeping that data. NetFlow, you don’t have that. It’s metadata. Even with the new things that you can get, that we talked about a couple of slides ago, it’s still the metadata. It’s still data about the data. It’s not the actual end information. So even without that content, NetFlow still provides an excellent means of guiding the investigations, especially in an attack scenario. So here, if you bundle everything that we’ve talked about so far into one kind of view and relate it to what we do here at NetFlow Auditor. You would see it on this screen. There are the end-users of people/content and things today, the Internet of things. So you’ve got data coming from security cameras and Internet-connected vehicles and refrigerators. It could be just about anything, environmental-type information. It’s all producing data. That data is traversing the network through multiple different types of platforms, or routers, switches, servers, wireless LAN controllers, cloud-based systems and so forth, all of which can provide correlation of the information and data. We call that the correlation API. We then take that data into NetFlow Auditor. We combine it with outside big data, we’re going to talk about that in a minute, so not only the data of the connections but actual third-party information that we have related to known bad actors in the world and then we can use that information to provide you, the user, multiple benefits, whether it’s anomaly detection, threat intelligence, security performance, network accounting, all of the sort of standard things that you would do with NetFlow data. And then lastly, integrate that data out to other third-party systems, whether it’s your managed service provider or security service provider. It could be upstream event collectors, trappers, log systems, SOAPA ecosystems, whether that’s on-premise or in the cloud or hybrid cloud. All of that is available via our product. So it starts at the traffic level. It goes through everything. It provides the data inside our product and as well as integrates out to third-party systems. So let’s actually look into this a little more deeply. So the threat intelligence information is one of the two major components of our cyber security areas. One, the way this works is that threat data is derived from a large number of sources. So we maintain a list, effectively, a database of known bad IP addresses, known bad actors in the world. We collect that data through honeypots, and threat feeds, and crowd sources, and active crawlers, and our own internal user cyber feedback from our customers and all of that information combined allows us to maintain a very robust list of known bads, basically. Then we can combine that cyber intelligence data with the connection data, the flow data, the session data, inside and outside of your network, you know, the communications that you’re having, and compare the two. So we have the big data threats. We can process that data along with what’s happening locally in your network to provide extreme visibility, to find who’s talking to who, what conversations are your users having with bad actors, ransomware, botnets, ToR, hacking, malware, whatever it may be and we then provide, of course, that information to you directly in the product. So we’re constantly monitoring for that communication and then we can help you identify it and remediate it as soon as possible. As we look into this a little bit zoomed in here a little bit, you can see that that threat information can be seen in summary or in detail. We have it categorized by different threat levels, types, severities, countries of origin, affected IPs, threat IPs. As anyone who’s used our product in the past knows, we always provide an extreme amount of flexibility to really slice and dice the data and give you a view into it in any way that is best consumed by you. So you can look at things by type, or by affected IP, or by threat IP, or by threat level, or whatever it may be and of course, no matter where you start, you can always drill in, you can filter, you can re-display things to show it in a different view. Here’s an example of identifying some threat. These are ransomware threats, known ransomware IPs out there. I can very easily just right-click on that and say, “Show me the affected IP.” So I see that there’s ransomware. Who’s affected by that? Who is actually talking to that? And it’s going to drill right down into that affected IP or maybe multiple affected IPs that are known to be talking to those ransomware systems outside. You could see when it happened. You can see how much traffic. Certainly, in this example our top affected IP here certainly has a tremendous amount of data, 307 megs over that time period, much more than the next ones below that and so that’s clearly one that needs to be identified or responded to very quickly. It can be useful to look at this way, to see if, “Hey,” you know, “Is this one system that’s been infiltrated or is it now starting to spread? Are there multiple systems? Where is it starting? Where is it going and how can I then sort of stem that tide?” It very easy to get that kind of information. Here’s another example showing all ransomware attack, traffic, traversing a large ISP over a day. So whether you’re an end-user or certainly a service provider, we have many, many service provider customers that use this to monitor their customer’s traffic and so this could be something that you look at to say “Across all of my ISP, where is that ransomware traffic going? Maybe it’s not affecting me but it’s affecting one of my customers.” Then we can be able to drill into that and to alert and alarm on that, potentially block that right away as extra help to my customers. Ransomware is certainly one of the most major scary sort of things that’s out there now. It’s happening every day. There are reports of police stations having to pay ransom to get their data back, hospitals having to pay ransom to get their data back. It’s kind of interesting that, to our knowledge, there has never been a case where the ransomers, the bad guys out there haven’t actually released the information back to their customers and supply the decryption key. Because they want the money and they want people to know, “Hey, if you pay us, we will give you your data back,” which is really, really frightening, actually. It’s happening all the time and needs to be monitored very, very carefully. This is certainly one of the major threats that exist today. But there are other threats as well; peer-to-peer traffic, ToR traffic, things like that. Here’s an example of looking at a single affected IP that is talking to multiple different threat IPs that are known to have been hosting illicit content over this time period. You could see that, clearly, it’s doing something. You know, if there is one host that is talking to one outside illicit threat IP, okay, maybe that’s a coincidence or maybe it’s not an indication of something crazy going on. But when you can see that, in this case, there’s one internal IP talking to 89 known bad threat IPs who have been known to host illicit traffic, okay, that’s not a coincidence anymore. We know that something’s happening here. We can see when it happened. We know that they’re doing something. Let’s go investigate that. So that’s just another way of kind of giving you that first step to identify what’s happening and when it’s happening. You know, sometimes, illicit traffic may just look like some obscured peer-to-peer content but it actually…Auditor, our product allows you to see it for full forensic evidence. You know, you could see what countries are talking to, what kind of traffic it is what kind of threat level it is. It really gives you that full-detailed data about what’s happening. Here’s another example of a ToR threat. So people who are trying to use ToR to anonymize their data or get around any kind of traffic analysis-type system will use ToR to try and obfuscate that data. But we have, as part of our threat data, a list of ToR exits and relays and proxies, and we can look at that and tell you, again, who’s sending data into this sort of the ToR world out there, which may be an indication of ransomware and other malware because they often use ToR to try and anonymize that data. But it, also, could be somebody inside the organization that’s trying to do something they shouldn’t be doing, get data out which could be very nefarious. You never want to think the worst of people but it does happen. It happens every day out there. So again, that’s another way that we can give you some information about threats. We, also, can help you visualize the threats. Sometimes, it’s easier for those to understand by looking at a nice graphical depiction. So we can show you where the traffic is moving, with the volume of traffic, how it’s hopping around in, in this case a ToR endpoint. ToR is weird. The point of ToR is that it’s very difficult to find an endpoint from another single endpoint. But being able to visualize it together actually allows you to kind of get a hand on where that traffic may be going. In really large service providers where, certainly, people who are interested in tracking this stuff down, they need a product that can scale. We’ve got a very, very great story about our massive scalability. We can use a hierarchical system. We can add additional collectors. We can do a lot of different things to be able to handle a huge volume of traffic, even for Tier 1-type service providers, and still provide all of this data and detail that we’ve shown so far. We also have port usage. So we can look at individual ports that are known threats over whatever time period you’re interested in. We could see this is port 80 traffic but it’s actually connecting to known ToR exits. So that is not just web surfing. You can visualize changes over time, you can see how things are increasing over time, and you can identify who is doing that to you. Here’s another example of botnet forensics. Understanding a conversation to a known botnet command and control server and so many times, those come through, initially, as a phishing email. So they’ll just send millions of spam emails out there hoping for somebody to click on it. When they do click on it, it downloads the command and control software and then away it goes. So you can actually kind of see the low-level continual spam happening, and then all of a sudden, when there’s a spike, you actually get that botnet information, the command and control information that starts up and from there all kinds of bad things can happen. So identifying impacted systems that have more than one infection is a great way to really sort of prioritize who you should be looking at. We can give you that data. I could see this IP has got all kinds of different threats that it’s been communicating to and with. You know, that is certainly someone that you want to take a look at very quickly. Another thing that we do as part of our cyber bundle, if you will, is anomaly detection and what we call “Two-phased Anomaly Detection.” Most of what I’ve talked about so far has been related to threat detection, matching up those known bads to conversations or communications into and out of your network. But there are other ways to try and identify security problems as well. One of those is anomaly detection. So anomaly detection is an ability of our product to baseline traffic in your network, lots of different metrics on the traffic. So it’s counts, and flows, and packets, and bytes, and bits per second, and so forth, TCP flags, all happening all the time. So we’re baselining all the time, hour over hour, day over day and week over week to understand what is normal and then use our sophisticated behavior-based anomaly detection, our machine learning ability to identify when things are outside the norm. So phase one is we baseline so that we know what is normal and then alert or identify when something is outside the norm and then phase two is running a diagnostic process on those events, so understanding what was that event, when did it happen, what kind of traffic was involved, what IPs and ports were involved, what interfaces did the traffic go through, what does it possibly pretend, was it a DDoS-type attack, was it port sweeper or crawler-type attack – what was it? And then the result of that is our alert diagnostic screen like you can see in the background. So it qualifies the cause and impact for each offending behavior. It gives you the KPI information. It generates a ticket. It allows you to integrate with other third-party SNMP traps, trap receivers so we can send our alerts and diagnostic information out as a trap to another system and so everything can be rolled up into a more manager and manager-type system, if you wish. You can intelligently whitelist traffic that is not really offensive traffic that we may have identified as an anomaly. So of course, you want to reduce the amount of false positives out there and we can help you do that. So to kind of summarize…I think we’re just about at the end of the presentation now. 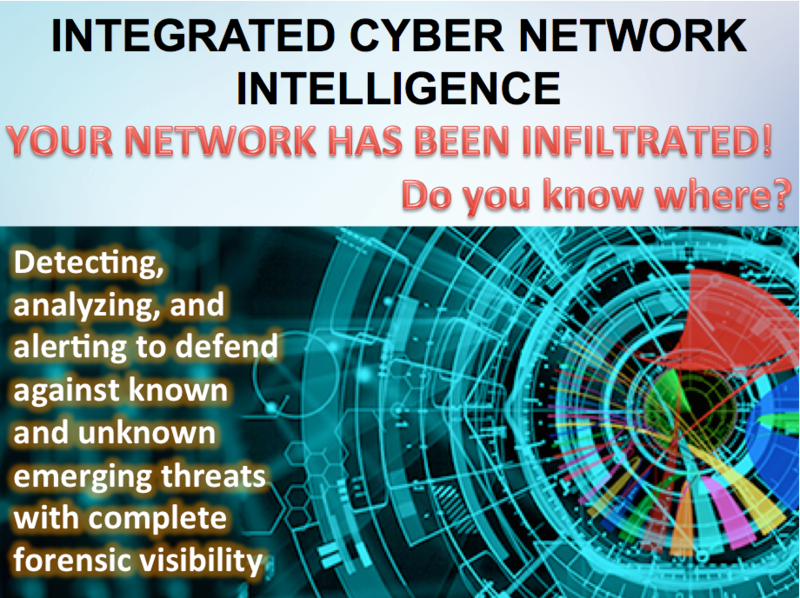 To summarize, what can NetFlow Auditor do in our cyber intelligence? It really comes down to forensics, anomaly detection, and that threat intelligence. We can record and analyze, on a very granular level, network data even in extremely complex, large, and challenging environments. We can evaluate what is normal versus what is abnormal. We can continually monitor and benchmark your network and assets. We can intelligently baseline your network to detect activity that deviates from those baselines. We can continuously monitor for communication with IPs of poor reputation and remediate it ASAP to reduce the probability of infection and we can help you store and compile that flow information to use as evidence in the future. You’re going to end up with, then, extreme visibility into what’s happening. You’re going to have three-phase detection. You have full alerting and reporting. So any time any of these things do happen, you can get an alert. That alert can be an email. It can be a trap out to another system as I mentioned earlier. Things can be scheduled. They’re running in the background 24/7 keeping our software’s eyes on your network all the time and then give you that forensics drill-down capability to quickly identify what’s happened, what’s been impacted, and how you can stop its spread. The last thing we just want to say is that everything that we’ve shown today is the result of a large development effort over the last number of years. We’ve been in business for over 10 years, delivering NetFlow-based analytics. We’ve really taken a very heavy development exercise into security over the last few years and we are constantly innovating. We’re constantly improving. We’re constantly listening to what our customers want and need and building that into future releases of the product. So if you are an existing customer listening to this, we’d love to hear your feedback on what we can do better. If you are potentially a new customer on this webinar, we’d love your ideas from what you’ve seen as to if that fits with what you need or if there’s other things that you would like to see in the product. We really do listen to our customers quite extensively and because of that, we have a great reputation with our customers. We have a list of customers up here. We’ve got some great quotes from our customers. We really do play across an entire enterprise. We play across service providers and we love our customers and we think that they know that and that’s why they continue to stay with us year after year and continue to work with us to make the product even better. So we want to thank everybody for joining the webinar today. We’re going to just end on this note that we believe that our products offer the most cost-effective approach to detect threats and quantify network traffic ubiquitously across everything that you might need in the security and cyber network intelligence arena and if you have any interest in talking to us, seeing a demo, live demo of the product, getting a 30-day evaluation of the product, we’re very happy to talk to you. Just contact us. If you’ve got a salesperson and you want to get threat intelligence, we’re happy to enable it on your existing platform. If you are new to us, hit our website, please, at netflowauditor.com. Fill out the form for a trial, and somebody will get to you immediately and we’ll get you up in the system and running very, very quickly and see if we can help you identify any of these security threats that you may have. So with that, we appreciate your time and look forward to seeing you at our webinar in the future. Bye.